The Journal of Modern Wisdom has returned! The Journal of Modern Wisdom volume 2 is a selection of diligently-written, accessible essays seeking to reassert the importance of wisdom in the modern world, all accompanied once again by exquisite illustrations from resident artist Thais Beltrame. Contributors to volume 2 include Theodore Dalrymple, Jules Evans, William Irwin, Nicholas Maxwell and Tom Barker, plus editor Ben Irvine, poet Rebecca Watts, and an anonymous, high-ranking academic unleashing a glorious polemic against the philosophical establishment. Addressing a cluster of topics traditionally neglected by the intelligentsia – such as self-control, self-help, community mindedness and responsibility – the journal’s message is both radical and, deep-down, familiar, providing provocation and inspiration in equal measure. For public thinkers and the thinking public, copies of the Journal of Modern Wisdom (volumes 1 and 2) are available for £4.99 from www.modernwisdom.co.uk. A third volume of the Journal of Modern Wisdom is already being planned. To get involved, please do get in touch on info@oldspeak.co.uk. Read more about The Journal of Modern Wisdom has returned! A while ago, Cycle Lifestyle created a really cool giant poster showing the London Cycle Map and explaining why a single, Tube-style map and network of signed cycle routes is so important for the capital. The excellent chaps at PleaseCycle (Ry and Ronan, pictured below) were generous (and gung-ho) enough to put the poster up in their offices near Oxford Street. Thanks so much, guys! Cycle Lifestyle and PleaseCycle are kindred spirits - both are social enterprises seeking to promote the psychological, social, health and economic benefits of cycling. Whereas we send magazines into workplaces, PleaseCycle provides a fantastic online platform which enables employees to share information and encouragement when it comes to getting cycling. Find out more here. To read the poster, click here or on the image below. There are thousands of kilometres of safe cycle routes in London. These routes comprise the London Cycle Network (LCN), which has been developed over the last 30 years. Many LCN routes are on quieter backstreets, lacking the buses and trucks and fast moving motor vehicles found on the main roads. The LCN is underused because no-one knows where its routes are or where those routes lead to. What is needed is a London Cycle Map and system of signage to make the LCN accessible to all. Often you hear people say that the backstreet routes of the LCN are too slow. This is nonsense: the streets comprising those routes are comparable in size to the streets of Cambridge, where more people cycle than in any other city in Britain. In any case, segregated cycling facilities on main roads in London would create routes no faster than the backstreet routes which already exist there: the act of creating a smaller space dedicated to cycling would slow down the cyclists currently using the main roads. Obviously, the major problem with the idea of campaigning for cycle facilities on main roads (as a rule, as opposed to an option) is that it is ideological, confrontational and never going to succeed. There are too many main roads in London for the policy to succeed in creating safe, continuous routes, the likes of which are needed to inspire new cyclists. And, of course, anyone who is not a hypocrite (i.e. an anti-capitalist with a nicely stocked fridge) knows that a city of 10 million people will always need motorized transport. The article states that "cyclists are forced to share the streets with fast-moving heavy motor traffic". This is obviously false: there are plenty of other streets cyclists could cycle on in London, for instance on the LCN. Without a decent map and system of signage for the LCN, cyclists certainly END UP being tempted to use the main roads, for ease of navigation. But this is not the same as being forced. It is tempting for me to misuse the word 'force' and declare that the LCC's obsession with main roads is 'forcing' cyclists onto main roads. This would be inaccurate, needless to say. But by overlooking the network of thousands of safer cycle routes that already exist in London, in favour of an ideologically driven confrontation with capitalism, the LCC is not, in actual fact, doing as much as it could to keep cyclists out of harm's way. Many thanks to Geoffrey Hunter for the latest guest blog on cyclelifestyle.co.uk. Geoffrey is a lapsed cyclist, heritage enthusiast and occasional writer. His day job is Head of Parish Property Support for the Diocese of London and he is also on the board of the Heritage of London Trust. Margaret Thatcher is apocryphally quoted as saying, ‘A man who, beyond the age of 26, finds himself on a bus can count himself as a failure’. While I wouldn’t go so far as to say I have found myself in the eight years since I was 26, I think it is true to say that if I were forced to travel by bus simply because I couldn’t afford to travel on the Tube, then I would feel a bit let down by two degrees and a lot of hard work. And so I thought it was with bikes – the transport of last resort for the impecunious. At university I had an annual bike-mileage well into the thousands, with a daily commute from Kilburn to the Strand. My bike was part of my character, something my friends and family immediately associated with me, together with the accompanying anecdotes of idiot drivers and suicidal pedestrians. Then came my first job with a car attached and it all went to pot. I’m now trying to work out why. Traffic conditions aren’t so much different now to how they were ten years ago. For cyclists there are more dedicated lanes and crossings than ever before; bendy buses are just a bad dream from a different time. And yet there is something that stops me from getting a bike and riding around town just like I used to. The hassle of finding somewhere to lock it up, the sweaty shirts and aroma of effort imposed on colleagues, the circuitous search for the safety of quiet backstreets, the getting lost down deserted dead ends, the unexpected stumbling upon London’s hidden past, the thrill of learning my way round our capital city in a way more surprising and rewarding than any other... actually, I just remembered: I REALLY like cycling! So this year I have resolved to bury my fears and prejudices and be a bit more proactive in seeking opportunities to get on a bike and explore. Being one of the sickening minority of Londoners privileged to walk to work, I have to find my opportunities where I can. I can say with honesty that, thinking back through my cycling years, my finest moments on a bike were not the obvious: Edgware Road to Parsons Green in 17 minutes; creaming past an overweight, over-equipped executive cyclist in Regents Park on my rusty upright while smoking a cigarette (to give him credit, he did laugh and say “fair cop Gov”, or words to that effect). These achievements are as nothing compared with the best memories of being on a bike in London. The moments that stick in the mind are moments affected by the thrill (and I choose that word carefully) of discoveries that you would never make on a bus. The oasis of Shepherd Market, the narrow medieval lanes to the south of St Paul’s, the eerily quiet yuppie-infused backstreets of Wapping, the time-warp Victorian terraces of Bermondsey. That is why I’m taking my call to arms from an event planned for 14 September this year. The Heritage of London trust is joining up with a wide range of churches in London to put on Ride+Stride. 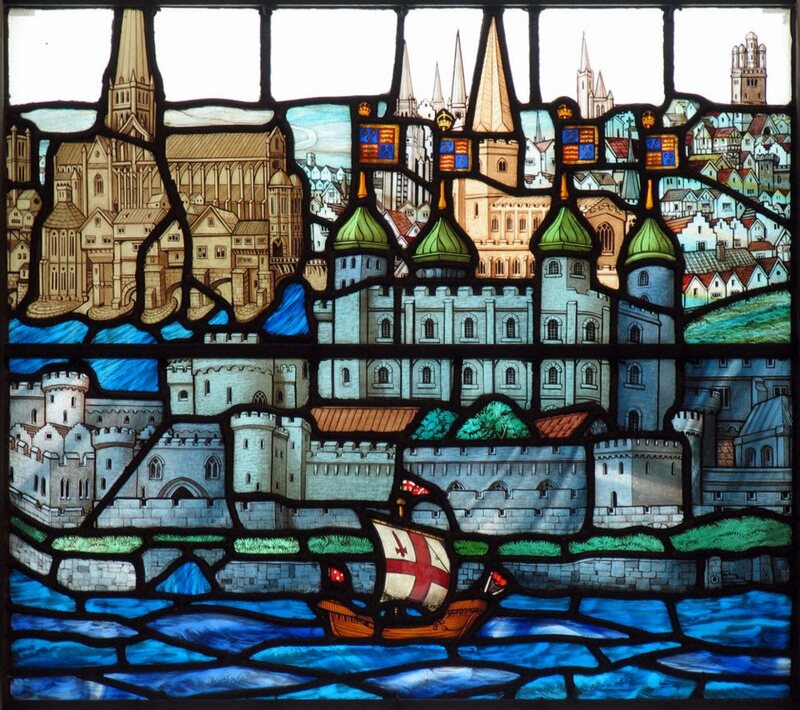 The event aims to raise the profile of churches as a part of our shared London heritage. The idea is you plan a route round as many churches as you can (or other places of worship, such as temples and mosques; this is not a partisan event) and get your friends to sponsor you. You can nominate half the money raised for your favourite Ride+Stride building, and the other half goes to the Heritage of London Trust to go into a special grant fund dedicated to supporting all historic places of worship in London. Many of these buildings are hidden in backstreets and rarely open to the public; yet they are all the ultimate expression of the architectural ambition of the communities that built them. From chapels, to cathedrals, to concrete blocks, many are listed buildings and none of them gets any direct state support to help with the cost of maintaining them for future generations. The aim I have on 14 September, and the aim that I think should be cajoling all London cyclists into action, is the opportunity for serendipity to lead us into the unexplored backwaters of our City, or into a building you know well from the outside, but have never entered; seeing the everyday from the other side. That’s what weekends are for, right? So how do I break the bad habit of recent years and get back in the saddle? Middle management largesse gives me the wherewithal to buy a brand new Bianchi and the Assos outfit and clip-ons to match. It also gives me some extra inches round the waist. I see the vision of that lumbering, park-bound executive looming up on my inside. No thanks! It’s to the back of my mum’s garage for me, armed with spanners, inner tubes and a can of 3-in-1, to resurrect that rusty steed of all those years ago, together with the thrill of discovery that went with it. See you there. I've just been reading about what rates as one of the cycling success stories of the past few years, possibly the decade. It is the London borough of Sutton that can claim one of the most massive turnarounds in commuter behaviour anywhere. In fact, so successful has the project been that now transport authorities in China, Singapore and Korea are looking to Sutton to provide a model for their own needs. Over only three years, and with the help of £5.1million in funding from Transport for London, Sutton has increased the number of people cycling by 75%, increased bus usage by 16% and decreased car usage by 6%.claim one of the most massive turnarounds in commuter behaviour anywhere. In fact, so successful has the project been that now transport authorities in China, Singapore and Korea are looking to Sutton to provide a model for their own needs. This has been achieved by two distinct routes. As expected, Sutton has improved the infrastructure and made the roads more cyclist-friendly, but it has also, rather unusually, spent money on encouraging people to cycle. A team called on every household in the borough, offering them a set of vouchers that gave them free cycling lessons, 10% off cycle clothing and 50% off a new bike. - All 68 schools in Sutton had travel plans in place two years before the Government deadline. - 16,000 of Sutton’s employees work for a company that has a travel plan in place. - 27,000 people went to Smarter Travel Sutton events during the last year of the plan. - 10,000 school children take part in the WoW initiative (Walk Once a Week). - Over 1,000 people have met with an Active Steps advisor for advice on improving their health by changing their travel habits. There has been a lot of negative reporting about cycling in London recently, due to some tragic road accidents involving cyclists. Inevitably, campaign groups have seized upon the incidents, demanding safer street layouts for bikes. I’ve got nothing against safer streets, but I’m not sure about the helpfulness of either the reports or the campaigners’ (some being highly paid professional marketers) outraged responses. If every road casualty – involving drivers, passengers or pedestrians – were remarked upon similarly in the media, there would be no space for any other news or views. It seems to me that exceptionalism when it comes cycling accidents is simply sensationalism, pandering to Joe Public’s neurotic fear of riding a bicycle. Needless to say, such provocation is especially counterproductive when it comes from cycling campaigners themselves. I am reminded of this every time I see one of those white ‘ghost bikes’ chained to railings beside the road where a cycling fatality has occurred. Surely these protests backfire, by reinforcing the majority’s spurious view that cycling is too dangerous. In any case, why not create a shrine for every other road casualty? And why stop there? What about a shrine on every spot where a heart attack or stroke victim fell? This, indeed, would presumably be more helpful to the cycling cause, since it would remind people about the importance of having a healthy lifestyle and getting plenty of exercise. Studies have shown that cycling protects against heart disease, stroke, obesity, dementia, diabetes, high blood pressure and some cancers, and supports healthy bones, muscles, joints and even sleep patterns. If only facts like these were drummed into the public consciousness, day in, day out, rather than the depressing inevitability of a tiny handful of devastating cycling accidents. This week I came across a wonderful new organization which is seeking to promote cycling’s health benefits. 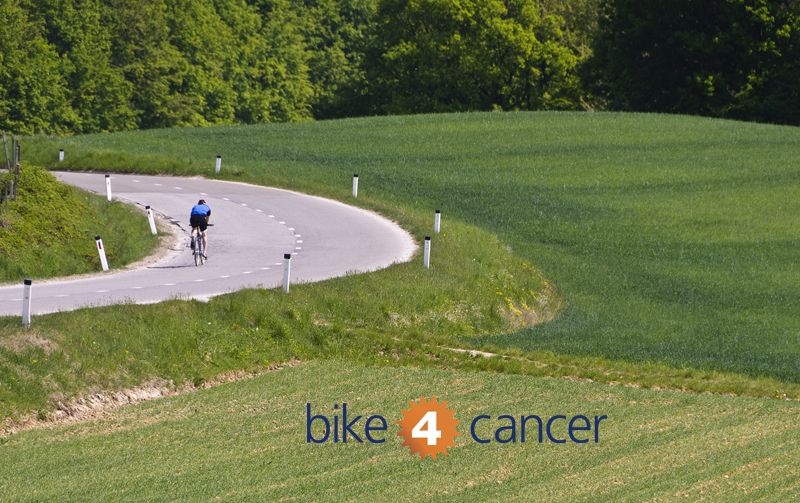 Bike 4 Cancer was set up by a group of keen cyclists who have all lost a family member or close friend to cancer. In addition to supporting research into the positive effects of exercise on health, this charity also provides days out and respite breaks for British families living with cancer (some of which are cycling related) and makes grants to palliative care centres. All in all, inspiring and essential work. So I was more than happy to help promote a special event being run by Bike 4 Cancer. They are calling for people from all over London and the South-East to join them on Sunday the 8th of September 2013 for a London to Brighton bike ride. The 56 mile ride starts in Clapham Common and travels through Mitcham, Carshalton, Chipstead, Banstead and Haywards Heath before finishing opposite Brighton Pier. Over 5,000 cyclists are expected to take part. The route has been specifically designed to take cyclists through some of the most beautiful countryside in the South of England. Before reaching Brighton, riders will tackle the infamous Ditchling Beacon – the highest point in the County of East Sussex at 814 feet above sea level! Andy Nicholson, Director of Services at Bike 4 Cancer said “The London to Brighton bike ride is one of the classic charity challenges in the UK. This ride is open to all riders over the age of 16 and is perfect for aspiring cyclists or even hardened racers”. He continued, “We’re encouraging people from all over London and the South-East to get on their bikes 4 cancer. So why not get a group of friends or work colleagues together and join in the fun. We can even help with bike hire and transport back from Brighton after the ride”. Andy concluded, “Given the emerging evidence that exercise can help us to reduce our chances of contracting some of the most common forms of cancer, this charity bike ride is a great opportunity to get active. You’ll also be helping people who are living with cancer in the UK now”. A £35 registration fee applies which includes a buffet lunch and breakdown assistance. Everyone who completes the ride will receive a medal. In addition to the entry fee, riders are asked to raise a minimum sponsorship fund of £100. 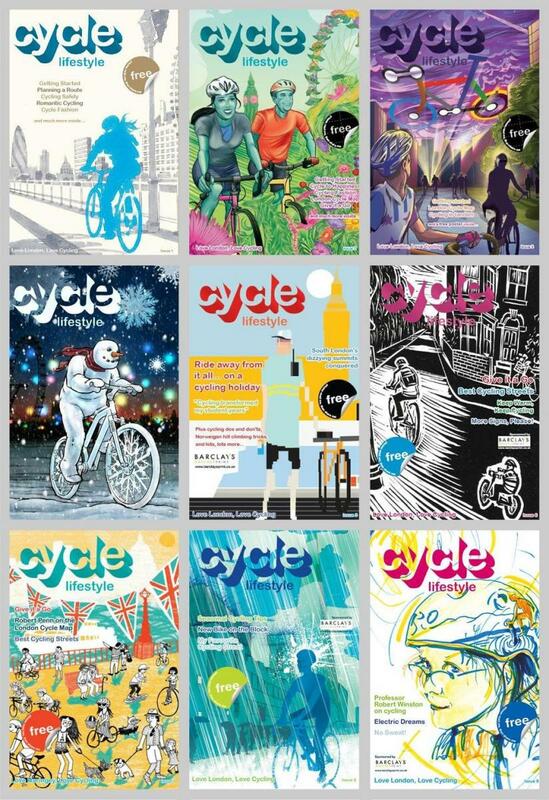 Here's a picture montage that shows all nine issues of Cycle Lifestyle published so far... and number ten is coming up this autumn! Do you want us to send some copies to YOUR workplace/school/organisation? We can add you to our distribution list, if you like. Bike thefts are on the increase in the City of London – don’t make it easy for thieves to get away with your bike. Take a look at our short YouTube clips to see just how easy it can be to steal a bike, and find out what you can do to give cycle thieves a rough ride. Our resident cycling expert, PCSO Scott Green, talks you through the best bike security options and how you can secure your bike to make it as hard as possible for someone to lift your pride and joy. Watch our cycle security awareness videos now and visit our website for further cycle security information. I’ve just returned from a wonderful stay in Kents Bank, Cumbria, in the marvellous ‘Lothlorien’ holiday cottage, which makes a perfect base for cycling in the area. The owner, Dave Chadwick, generously took me on a couple of long rides into the spell-binding countryside south of Lake Windermere. Here is this year’s winner of the Tour de Kents Bank – Ben Irvine. Ben who rides for the Cycle Lifestyle team is proudly showing off the winner’s yellow waterproof jacket. For this two day cycling challenge he was up against team Lothlorien rider Dave Chadwick, who had a number of mishaps. As the support car was jacked up on bricks back at home, the Cycle Lifestyle support team (Ben) sprang into action. When Dave Chadwick’s back mudguard fell off going over a cattle grid on stage 2, he was soon back up and running thanks to Ben who put the mudguard in the basket on the front of his bike. On both days team Lothlorien also lost their communication system. In other words, Dave dropped his mobile phone after taking photos. This extraordinary race even had a sprint finish. The pair were neck and neck sprinting down the half-mile track to the ice cream farm at Meathop. Unfortunately, fate played another cruel hand as the farm shop was closed! As you can see from the photo, the team racing kit of Cycle Lifestyle is the latest must-have cycle wear, which appears to be T shirt, tracksuit bottoms and walking trainers.